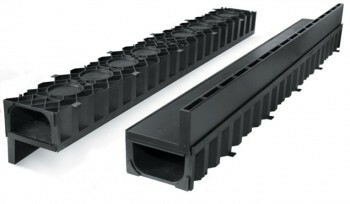 Manufactured using 100% recycled polypropylene, the highly successful 1m ACOimage HexDrain channel has been combined with a new offset slot cover specifically designed for slab and block paving, to create ACO HexDrain Brickslot. A range of innovative features and accessories, such as the corner unit for maintenance access, ensures the system makes installing domestic drainage easier than ever. The system is ideal for a wide range of domestic and light traffic applications and is CE marked and fully certified to Load Class A15 BS EN 1433:2002.